Breaking into the crowded trailer boat space takes guts, determination, hard work and most critically a point of difference. This is something Pinnacle Boats founder Alistair McEwen knows all too well. 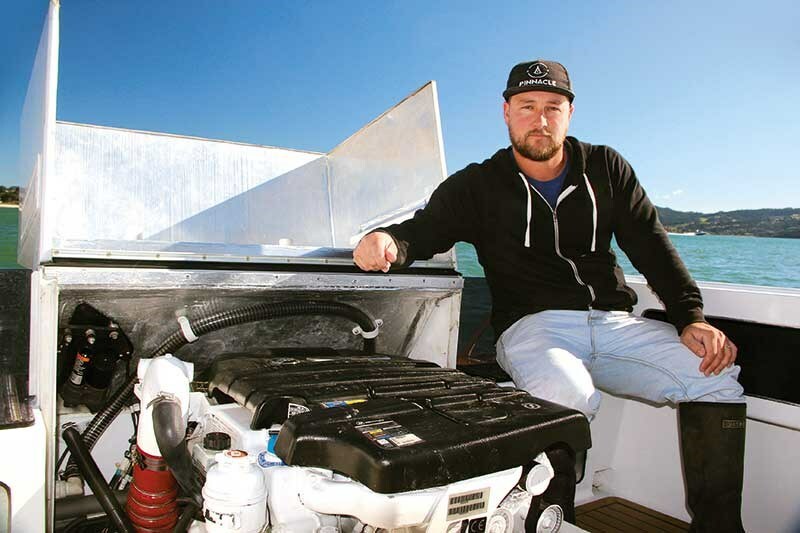 A professional boat builder by trade, McEwen has pushed the design envelope in new directions with the launch of his prototype diesel powered Pinnacle 660 SD. The result is an amalgam of yacht, launch and trailerboat – all rolled into one. Below the gunwale, the 660 SD is a conventional albeit ruthlessly efficient hull worked up by established boat designer Scott Robson. It is one of four designs commissioned by McEwen that will carry the Pinnacle Boats brand and will range in size from five-and-a-half to eight-and-a-half metres. Built on its side in a rented Auckland garage in four weeks flat and launched over the Christmas break, the prototype 660 SD was always intended to be a test platform to trial different ideas and layouts. As such, the boat has not been finished to what he would call a turn-key standard, says McEwen. He says the changes in mind for the next Pinnacle 660 SD run to several pages but the overall concept of a sub-7m diesel-powered trailer boat has been soundly proven, giving him confidence to forge ahead knowing that his concept is sound and the design worthy of further investment. 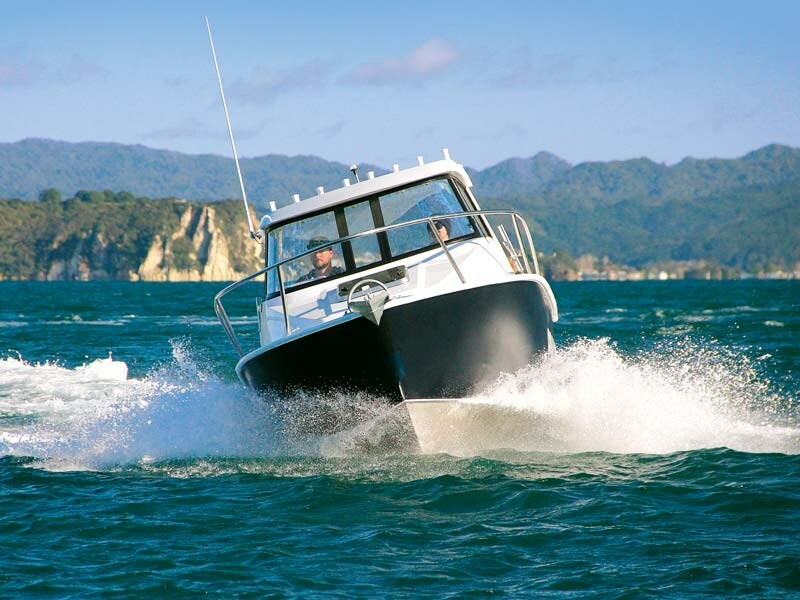 Putting aside minor finishing details, the 660 SD is a great looking boat on the water with a classic raised sheer, sculptured hard top and a close-fitting eyebrow tucked over a toughened curved glass windscreen. 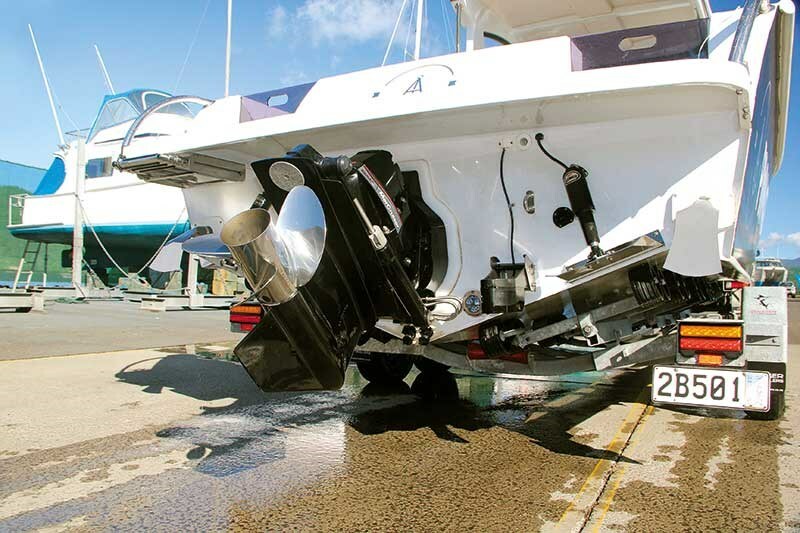 The transom carries a full width boarding platform to cover the Bravo One leg and trim tabs and it has a centrally-mounted engine box tucked into the transom to maximise cockpit space and double as a bait station. Large radius polished stainless steel hand rails are a feature of the boat, as too is the synthetic teak deck that lines the boarding platform and entire cockpit sole. It is these details that point to McEwen’s time as a boat building apprentice under the tutelage of Alan Tong, one of New Zealand’s best wooden yacht builders. The builder has avoided the temptation to compromise working space by building in box seating, relying solely on hi-rise pedestals. Similarly, cockpit storage has been kept to a minimum with single yet commodious cockpit shelves. These provide ample kick beneath the combings enabling the entire cockpit to be worked. Rod stowage is ample compliments of two holders in each combing and an eight-gang overhead rocket launcher. Game poles can also be dropped into holders on the exterior of the hardtop. 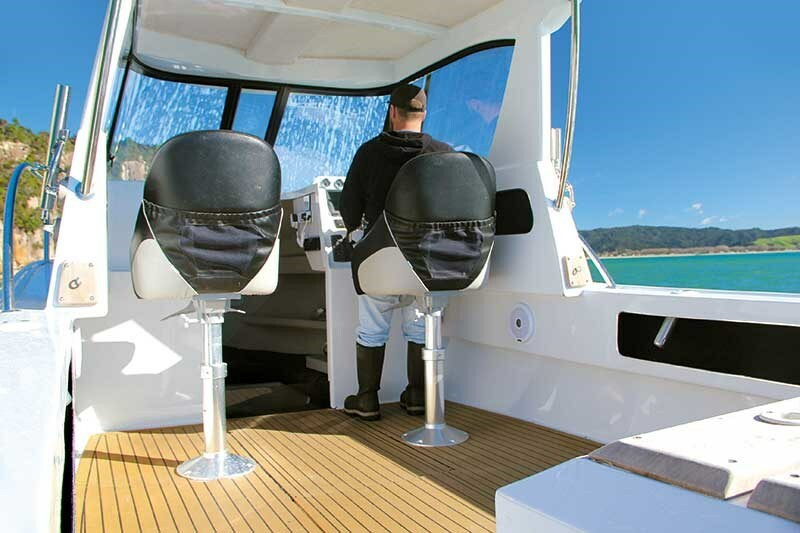 The transom is configured with a step-thru each side of the central engine box and is fitted with glass-fronted live bait tanks. These also provide a secure bridge deck between the cockpit and boarding platform. 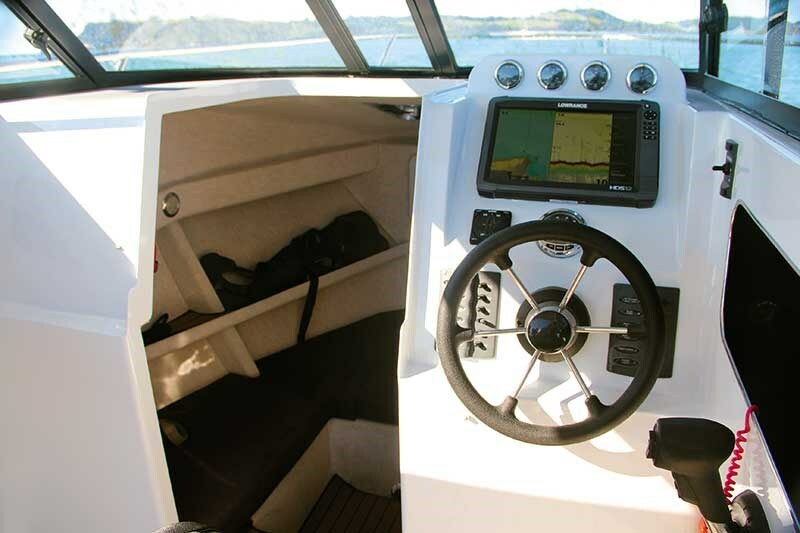 The cockpit is self-draining through scuppers fitted outboard of each bait tank. A large under floor bin is fitted just forward of the aft-opening engine hatch and 600 SD’s 200-litre under floor diesel tank is forward of the fish bin. The tank is roto-moulded plastic to approved USCG standards. The parallel lines of the synthetic teak create an illusion of length considerably greater than the actual and the contrast between the stark white painted combings and the teak is striking. 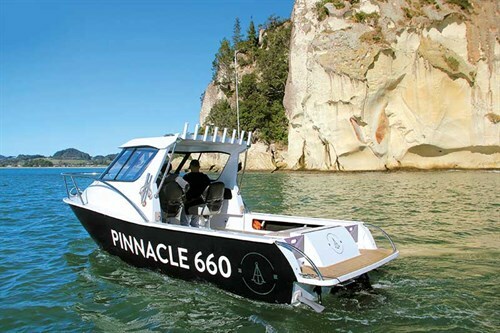 McEwen says the driving force behind the Pinnacle 660 SD concept is his belief that trailerboat buyers are not well served with diesel inboard options. As a keen game fisher, he appreciates the value anglers derive from frugal diesel-powered launches that can troll all day on the smell of an oily rag. "Fuel efficiency was the overriding objective in the 660," he says. "There are numerous factors that come into play in achieving this at the design stage. The boat had to have a slippery underwater profile and it had to be easily driven. It also had to be light yet strong and facilitate the weight of an engine tucked well aft in the cockpit. All these factors need careful calculation by a professional designer and that is why we chose to work with Scott Robson. "He has designed a hull that is comparatively light yet strong, easily driven and lifts to the plane quickly. The ride is excellent and the relatively deep deadrise (20.5-degrees) gives the boat good form stability without overly compromising stability at rest. "In the boat building game everything is about compromise but there is nothing extreme about the 660 SD and it has no obvious vices. There are things I’ll change in future builds but we’re rapt with the boat’s performance and handling." Stepping back onboard, the boat’s physical prowess defies its 6.60 SD moniker. This is due in part to a generous 2.5m beam and 7.20m overall length. The 660 actually refers to the boat’s waterline length. Despite the topside creep, the 660 SD weighs in at a very manageable 1900kg (dry). 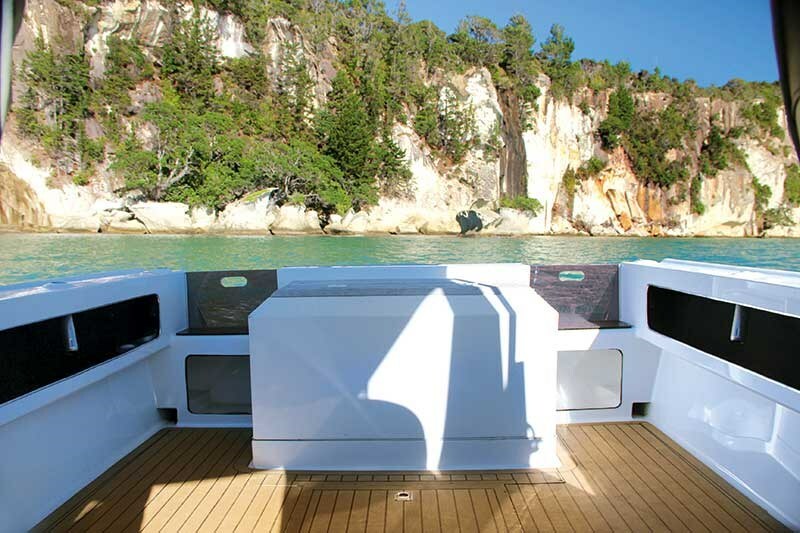 Construction is to standard industry specs with 5mm hull, 4mm topsides, 6mm transom and 3mm superstructure. The quality of aluminium fabrication and finish is first-class and demonstrates the value in pre-cut CAD panels, says McEwen. "The tolerances achieved are far tighter and everything comes together like a jigsaw," he says. "The finish is better and the build process is a whole lot quicker. I built this boat in 120 hours without a jig in a tiny garage." But there are no obvious shortcuts, save for a few items yet to be bolted to the boat. The open hardtop sits nicely on the deck and serves up ample head and leg room and adequate dash space for flush mounting instruments. Side-opening glass windows provide good ventilation and deep stowage lockers will gobble up your personal effects. The pedestal seats with bolsters are well placed and comfortable yet foot and hand holds are yet to be fitted. Cuddy access is better than many with a generous central companionway and an easy step down into the cabin. While a product of its dimensions, the cuddy is nevertheless big enough to stretch out in for the night. Anchoring is a breeze with a remote Maxwell winch operated from the cockpit and a free-fall chain and anchor that snugs into its chocks. The below deck anchor locker is large enough for serious ground tackle and there is inboard access to the locker from within the cuddy. 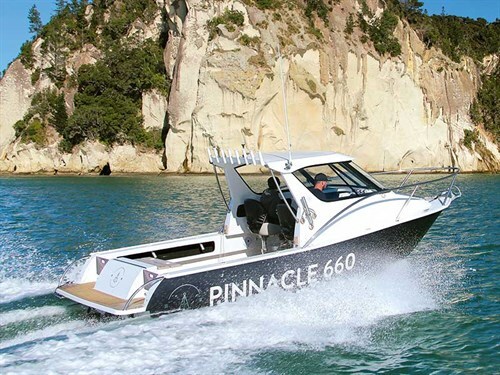 Steaming out of Whitianga Marina on a crisp and clear winter morning, the Pinnacle 660 SD looks a picture with its metallic matt black hull reflecting back a low winter sun. On board, the new generation Mercury 170hp 2.0L VGT (variable geometry turbo) diesel (with push button start) sounds purposeful idling beneath the engine cover. Mercury’s fly-by-wire throttle is feather light to the touch and responds to the slightest pressure. With power on, the 660 lifts out smartly and settles onto the plane without thrusting her bow to the heavens. However, with only 170 horses on tap there is a risk that some might find the 660 a little under powered. The hull is rated up to 200hp and the extra oomph would deliver a little more spirit but let’s not forget this configuration is all about economy. Ride-wise, the 660 SD is hard to fault. The hardtop is functional and effective and delivers on the promise of all-seasons boating. Skipping along at a fast cruise (3600rpm at 26 knots) there is no mistaking that the boat is diesel-powered with the turbo singing several octaves above the hum of the engine. Noise is a factor that has to be considered in weighing up the relative merits of diesel. In this instance sound proofing the engine cover would make a considerable difference. But if you’re planning on long days on the water and big distances, then the economics of diesel v petrol are compelling. McEwen has set out on a pathway to create a boat with a point of difference and he has succeeded. He acknowledges that the boat is a work in progress and is committed to getting his second generation Pinnacle designs on the water. He has no desire to mass produce the Pinnacle brand, preferring instead to specialise in bespoke boats customised to owners’ requirements and we can’t wait to see the drawings for his larger models come to life. Built on Mercury’s proven 2-litre in-line four-cylinder platform with common-rail technology, the new 150hp and 170hp variants meet the Tier-3 European emission standards and feature Mercury’s Variable Geometry Turbo (VGT) technology designed to reduce turbo lag. The new models round out Mercury’s diesel engine offering with models ranging from 115hp to 370hp. Rated for recreational and light commercial applications, the new engines are designed to provide peak torque (360Nm) at 2000rpm resulting in reduced time to plane and improved fuel economy across the rev range. Output power for the new 170hp model is rated at 127kW at 4000rpm and noise level in Mercury promotional material is quoted at an astoundingly low 68dB. 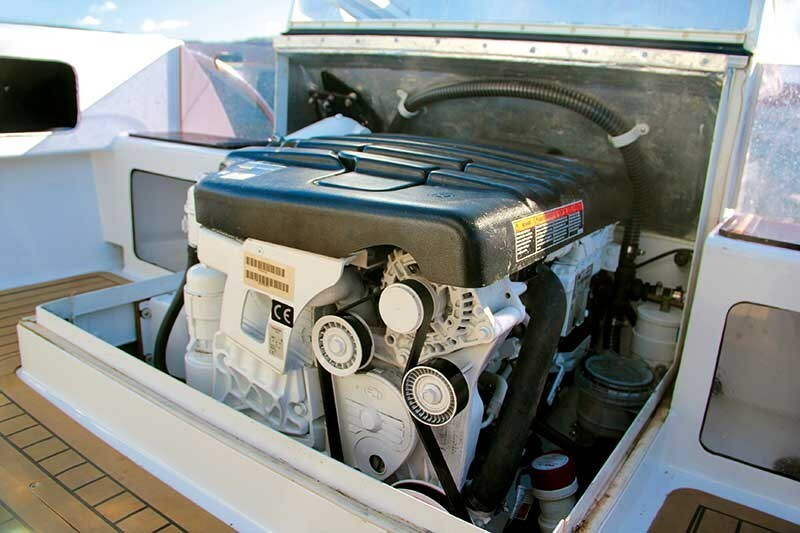 Compatible with Mercury’s SmartCraft proprietary technology and available for both inboard and stern leg propulsion, the new engines feature a cast iron block, aluminium cylinder head and single overhead camshaft. Lubrication is by way of tooth belt-driven oil pump and glycol-cooled oil cooler. The fuel system uses common rail injection technology and solenoid injectors for cleaner atomisation and precise fuel delivery. The cooling system is thermostatically controlled and closed loop for improved corrosion resistance. The exhaust system features similarly closed loop manifolds and sweater-cooled risers. A feature of the new engines is their minimal footprint measuring 80cm x 71cm making them one of the smallest diesels in their class. Dry weight is 264kg (engine only). During testing we found an optimal cruise of about 22 knots which saw 18 litres per hour being consumed by the thrifty Mercury. This gives an impressive range over 222 nautical miles or 411km with 10 per cent left in reserve from the 200-litre tank. For game junkies, a steady 8kt troll saw only 7.4 litres per hour being used or a touch under 200nm or 370km range. Considering it would take 24 hours to burn through 181 litres of fuel at trolling speeds, the combination is perfect for the weekend game fishers who travel far from fuel sources. Possibly most impressive though is the engines thirst, or lack thereof, at higher rpm. At 4000rpm, the engines maximum speed, the 660 would cover as much as 173nm with reserve by virtue of managing 0.95nm (1.76km) per litre. In recent testing of another 6.7m alloy hard top with class leading 200hp petrol outboard, at the same 30kt, we saw only 0.85nm (1.57km) per litre. The difference will more than make up for additional servicing costs in the long run.